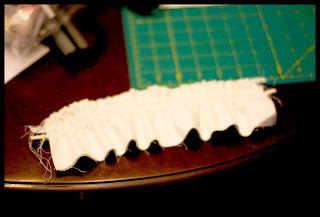 Remember when I was admiring Amy's petal skirt (I actually don't think this is the official meaning of a "petal skirt," but go with me here) on Project Runway, in this post? I have sewn up my own version and it is cute, cute, cute, even if I do say so myself. I also took pictures to write up a tutorial, so you can make one too. 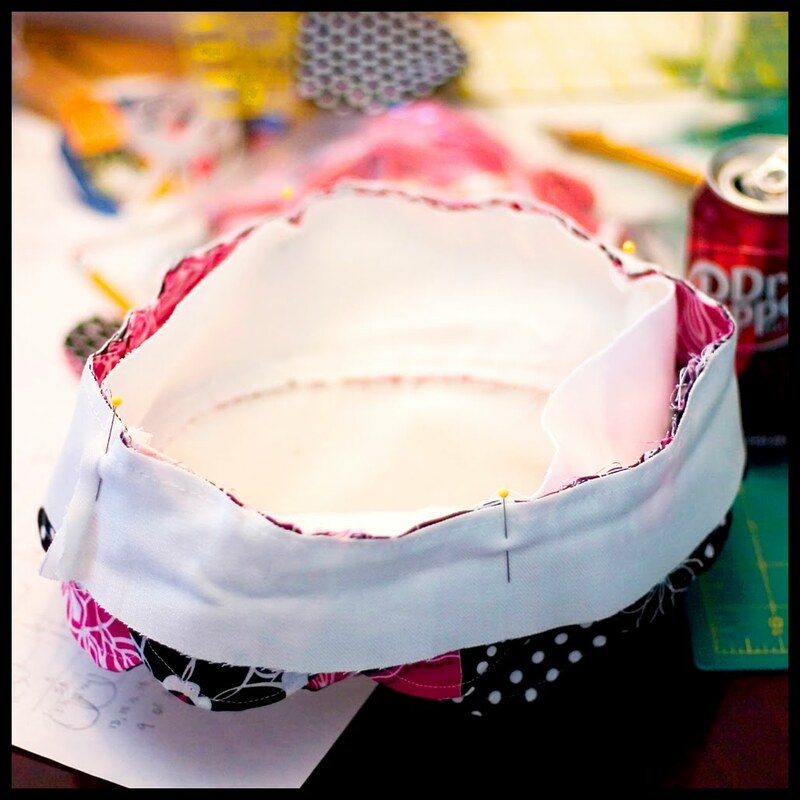 It's a pretty simple design and get this, there is no hem to sew. I hate hemming. Tedious and I almost always make mistakes. Now, you need to measure your subject. Bribe her with candy, if necessary. Get a waist measurement, which was 20" for Aubrey. Print out your pattern. Divide your waist measurement in half, and add one inch. This is how long your want your guide line to be. It should be 11" or so for size 3T. 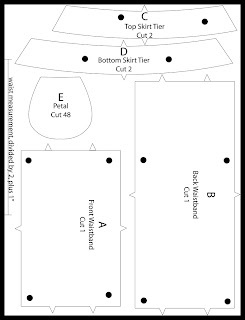 Print full-size on 8.5x11 paper for a skirt exactly my size (but you can easily scale the pattern up or down in your printer settings). The first page is an overview of the pattern, then the individual pages are after that. I've never tried to do a printable pattern like this, so I'm open to any suggestions you might have. Let me know if something isn't working. 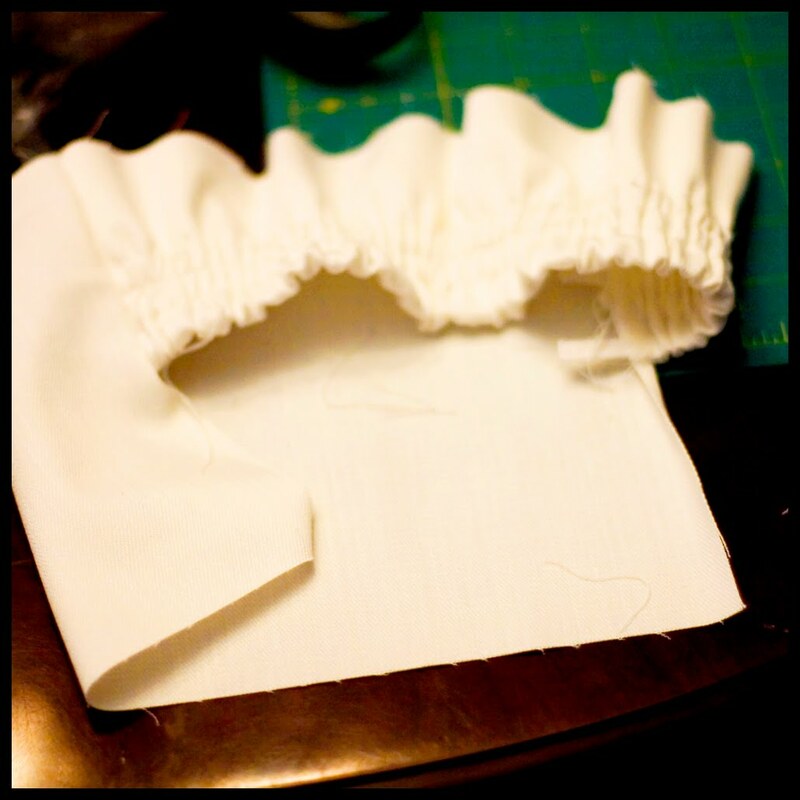 Cut all pieces from solid fabric except for petals. 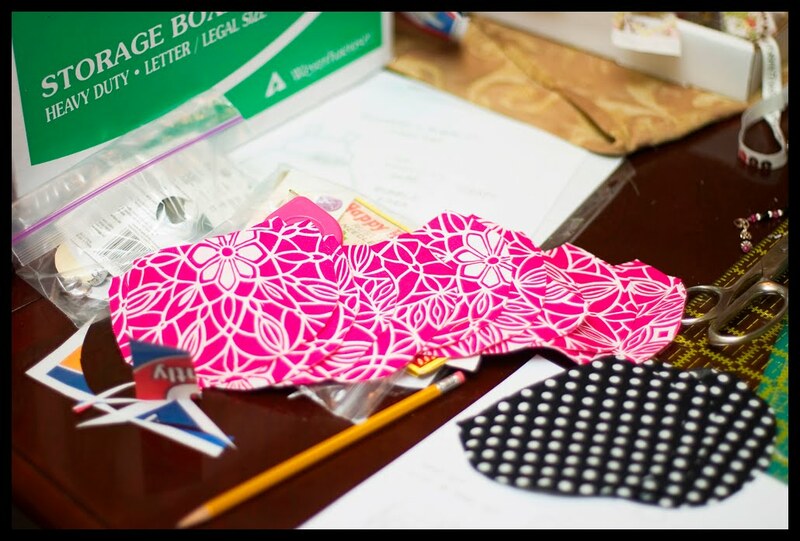 Cut 48 petals in three of the fabrics, or 16 in each color. I always cut them out two at a time. 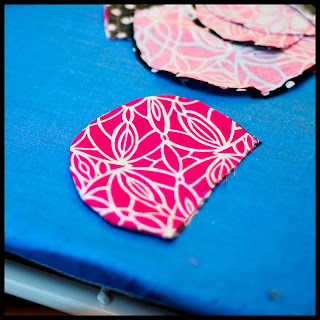 If you want to use interfacing on your petals, add it now. You would need 24 interfacing petals. Ok, first we are going to get those petals out of the way. 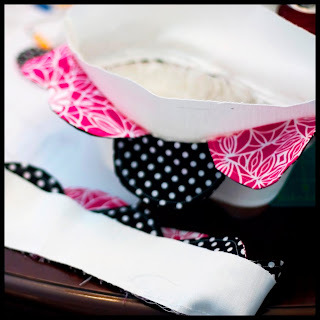 Sew around the curve, leaving the top open. 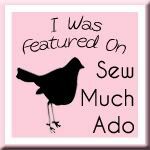 I used a 1/4" seam allowance. The key to making them lie flat is to turn smoothly, and not rumple them up as you turn. 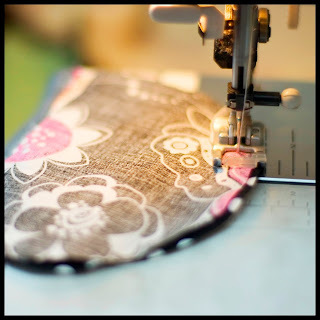 Another great tip is to chain stitch, this means you leave each piece on the thread, don't clip or pull it from your machine before starting another petal. 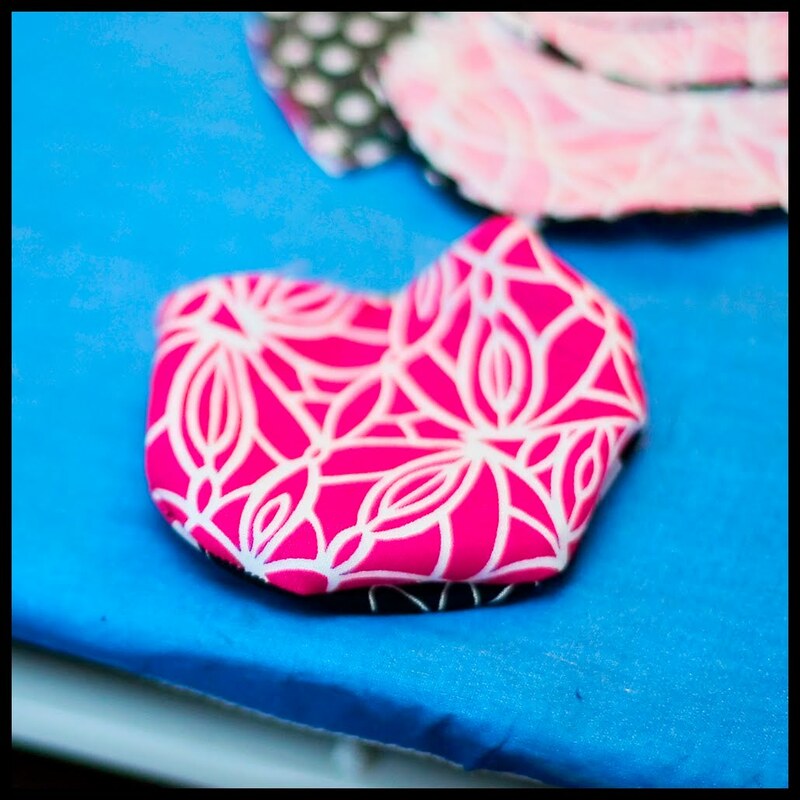 You will want a tiny space, maybe two stitches between the pieces. This saves enormous amounts of time and thread. 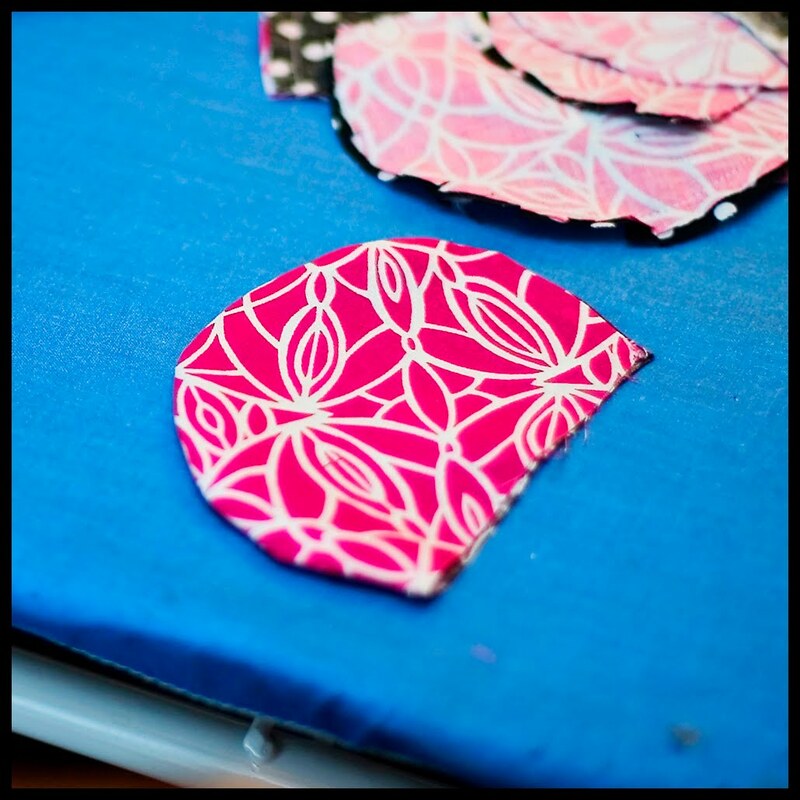 You might also notice later that I was having fun mixing up the backs of my petals, but feel free to sew like to like and save yourself the trouble of making them different and confusing. Sometimes the first run of a project isn't as thought through as I would like. 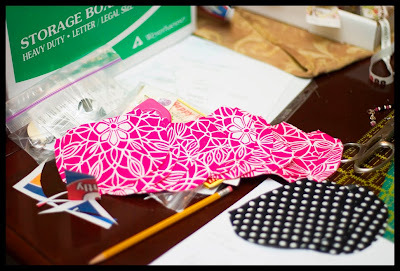 One you have all the petals sewn together, you need to clip the seams. I cut about 1/2" apart. This is tedious, but essential if you want non-lumpy petals. You should be seriously impressed that I managed to take this next picture all by myself, by holding the scissors in my right hand and the camera in my left, while trying to see if the camera was focusing with my right eye and trying to hold the scissors both far enough away so that the camera could focus and so they stayed in the right position on the petal. Anyone out there looking for a job as a photography assistant? The pay is super stinky. One you have them all clipped, turn them. They will look a little lumpy, like this. You want to press them, making them as smooth as possible, without any corners. I find it easiest to put my hand inside it, open my hand slightly, then with the other hand, hold it down as I pull my other hand out, then press. 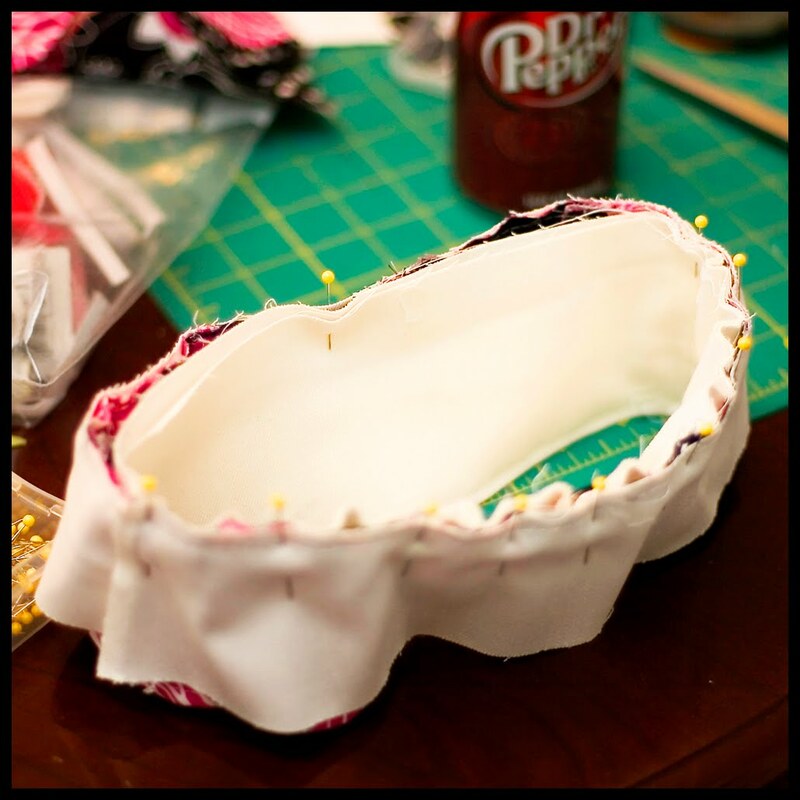 The goal is to get the stitching to open up as much as possible and to get a uniformly curved shape. Ok, once that is all done, top stitch the petals around the curve, again leaving the top open. Top stitching will help your petal keep its shape through the wash (as will the interfacing if you add it, which if I was making this skirt again, I would, even with how well it did hold up in the wash). 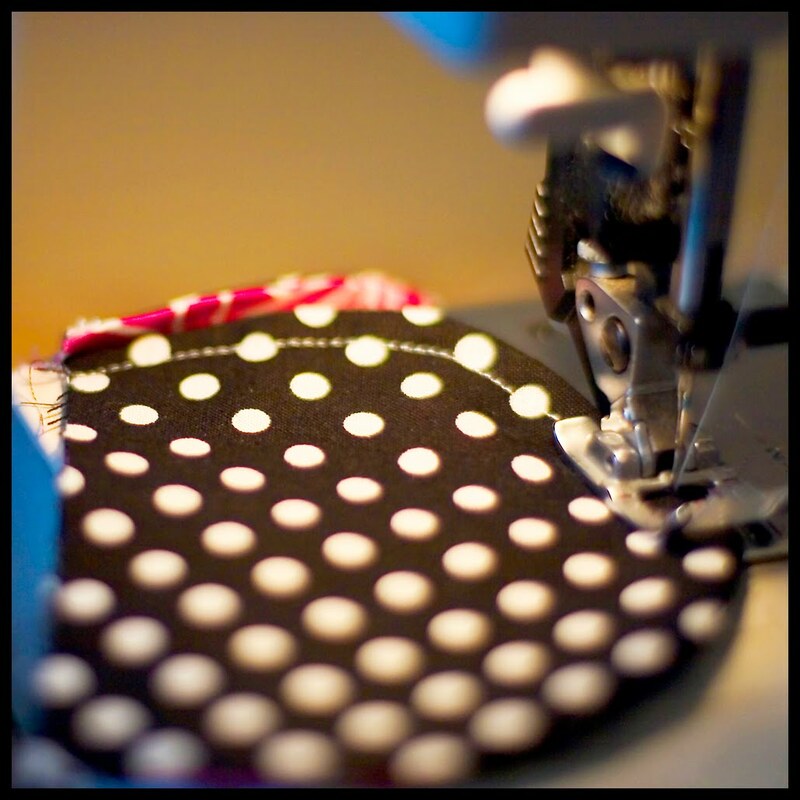 Chain stitching is also encouraged on this step. Take your petals and put them aside. I think it's probably smart to leave them on the chain, so you don't lose one as you're doing the other steps. Now we are going to make the waistband. I'm not a professional seamstress, all self- and mom-taught, so this might not technically be the "right" way, but it works for me and is a technique I use on all of Aubrey's skirts and pants, when I don't want gathers in the front. 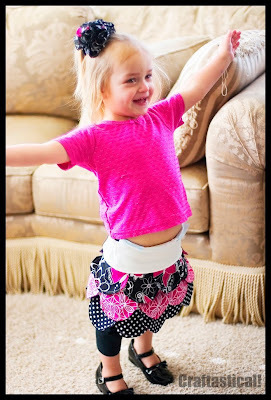 This method has gathering only in the back, leaving the front smooth, much like most of the store-bought toddler pants and skirts. 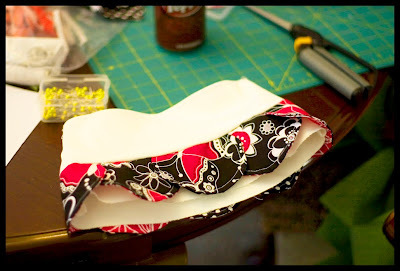 First off, take your back piece and fold it in half, hot dog way (this is a technical sewing term, bet you all are impressed, huh?). Iron it. Next, stitch about 1/2" down from the top of the fold. Then sew a second line 1/2" down from the first and a third and final line about 1/2" down from the second line. Cut three pieces of 1/4" elastic using the waist line guide on the pattern. Thread one through each casing you just sewed, using a safety pin is the easiest way for me, and tack the ends down. Your finished piece will look like this all bunchy (sorry it's not the greatest picture, but you get the idea). 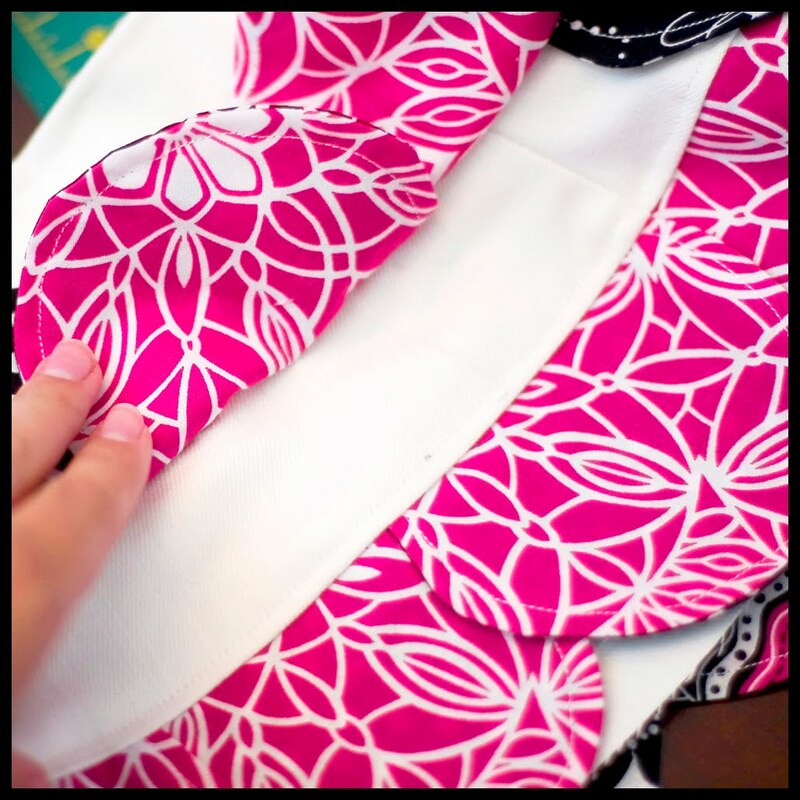 Now, take the front waistband piece and iron it in half, lengthwise as well. 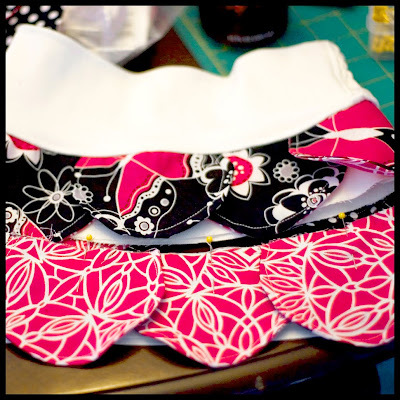 Line up the bottom of the back waistband and the bottom of the front. 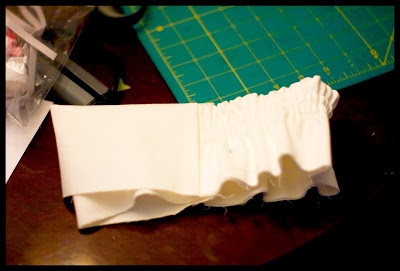 At this point, your gathered piece doesn't really have a front or back, but you want the right side of your front section to be up and against the back piece. Sew the each of the sides, stopping once you get to the middle. Flip the whole thing around and fold along the top. You should basically have a tube, with the elastic ends of the back waistband encased inside the front waistband and the raw edges all along the bottom. Then, top stitch along the sides to hold in place. You are now finished with the waistband! I'm really regretting that I did my example in white. I hope you can see enough to get the general idea. Then sew. Iron the seam up towards the waistband. Then top stitch, about 1/8" above the seam, all the way around. Just sew right over the gathering in the back. For the next tier we repeat the same basic process, with a few variations. Again, start with pinning the petals to the top of the 2nd tier piece D. Offset the petals, so you get a fish scale effect when combined with the top tier. Baste the petals to the tier, then pin to the bottom of the skirt so far, putting right sides together and lining up marks. As you sew, pull the petals on the top tier out of the way. Iron, then topstitch just above the seam. Again, this is the same basic process, with a few variations. Along the bottom of the 2nd tier, pin petals. This is slightly different from the last two steps, because you want to pin the remaining raw edges together, and the petals will face up, with the right side (if your petals have such a thing) down against the right side of the tier. Use the same positioning pattern as the first set of petals (admittedly, I didn't do a great job with this. Also, please note that the petals are closer together and have a lot more overlap on the top of the skirt than they do at the bottom). 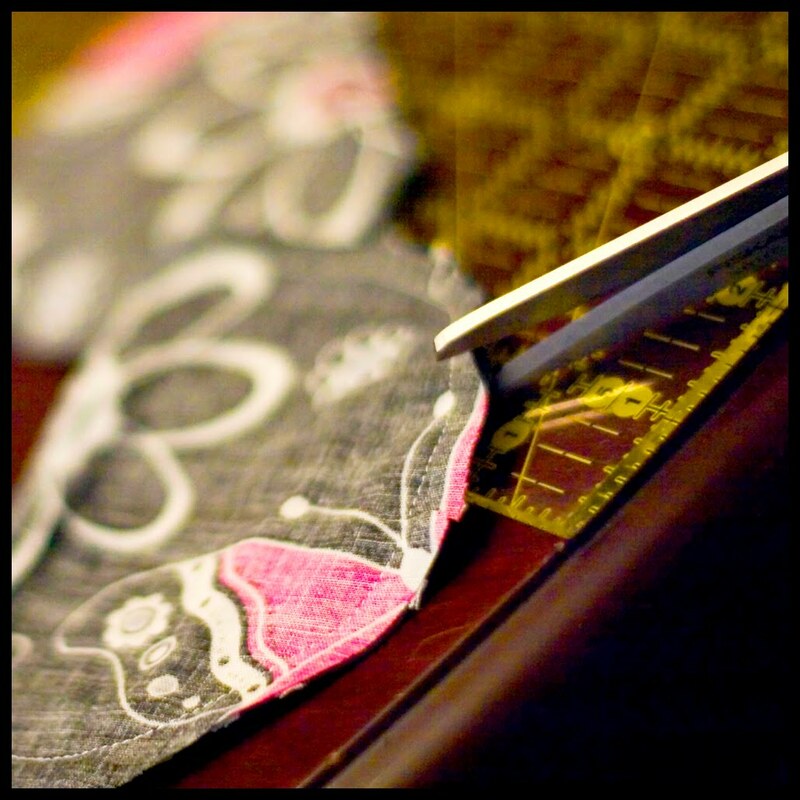 Sew around the bottom of the skirt, securing the petals (no need to baste on this step). 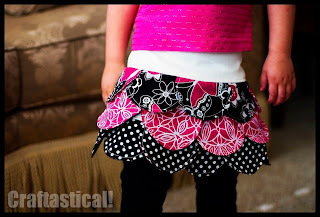 Again, iron seam toward top of skirt and top stitch. Trim any threads, and that's it! 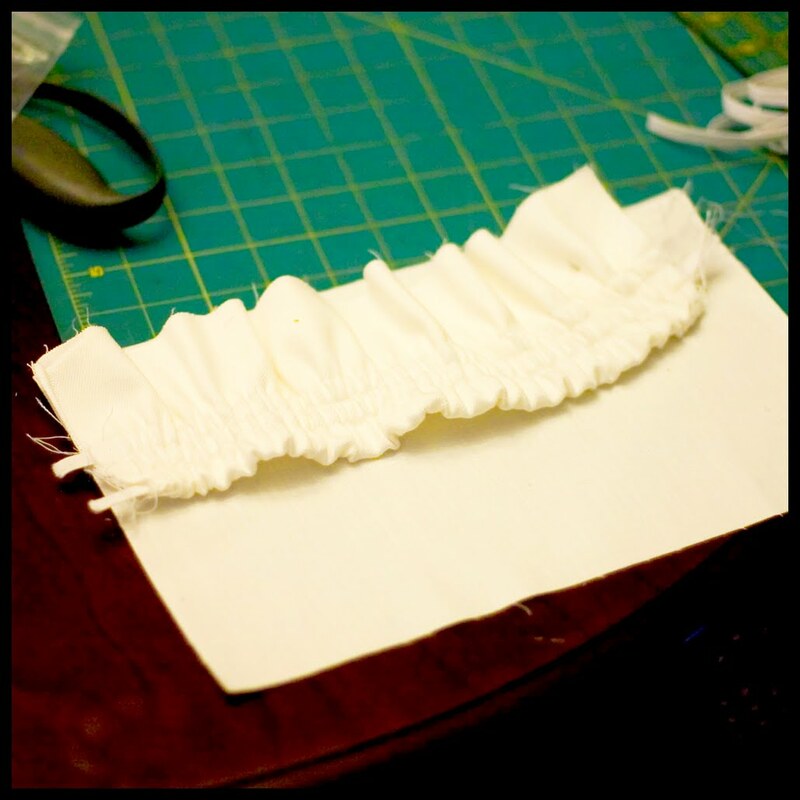 You're done and your skirt is ready to wear! Let me know if you have any questions; I'd love to help clarify anything. I hope this tutorial inspired you. This is ADORABLE. I've been looking for alternatives to the 100% polyester school uniforms that my foster kids are generally required to wear, and this just might fit the bill! My current little one ONLY will wear dresses, not skirts, but I'll keep this in mind for future kiddos! How darling!! if only.. I had a girl. I think this is a great idea. I just may have to try this. For rebkatz...if your up to it, take a shirt and add the tiers of "petals" to the bottom of the shirt to make a dress. I'm follower from Dishing It! That is VERY cute! Thanks for the tutorial! One of the cutest skirts I have ever seen. Thanks for sharing! So dang cute I love it and I love the colors! 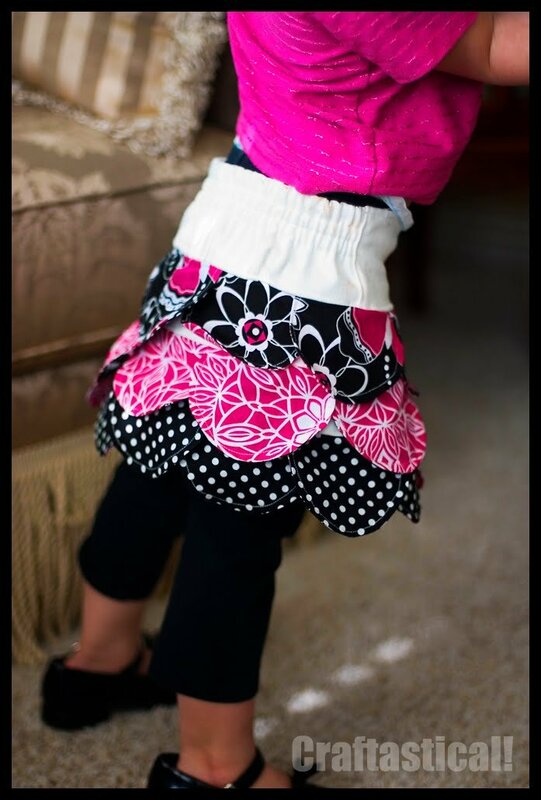 I will be trying the petal skirt, too! Oh I am so excited to do this... What a great idea! I can't believe I haven't seen your blog before. #2 we both share a love of crafts, crazy kids, and from the looks of it Dr. Pepper? omigosh SO cute! 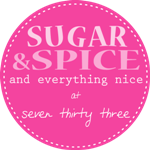 Thank you so much for sharing, and I'm off to see what your blog is all about! Oh My Goodness, I love this! I have a very picky 8yr old who is all about skirts right now. I think this could make us both happy. If that's possible! LOL. I want to run to my sewing machine and get started right now! I also love the suggestion of adding it to the bottom of a T shirt, to make a dress! Very cute! I love this skirt! I can't wait to make it (or attempt to). I'm still a new sewer but I think I can do this one :-). I love, love, love this! I'm definitely going to try it for my little fashionista! Great idea, mama! This is definitely CUTE, CUTE, CUTE! That is pretty stinking cute :). 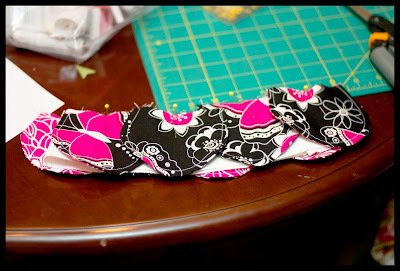 I featured this tutorial over on my blog at http://stellasola-boutique.blogspot.com/2010/04/tutorial-sunday.html Drop by and check it out! Absolutely, 100% darling! 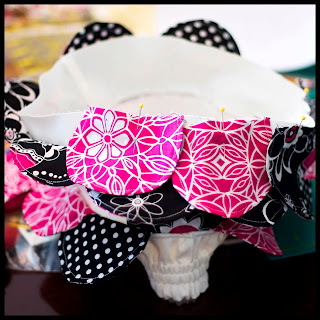 I love how you used the scallops as petals, and so kind of you to make a printable pattern, too! This is SO amazing and adorable! Really great job! 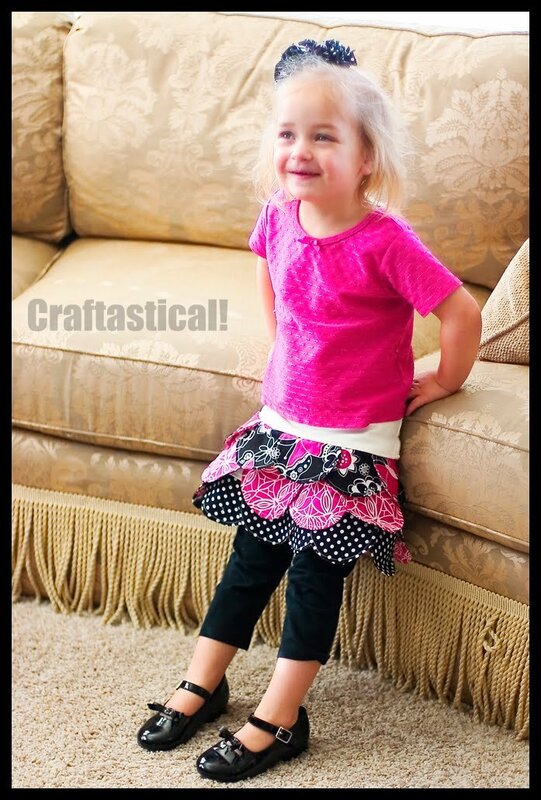 And what a cute little model! This is adorable! I'm visiting from CSI Project! What an adorable skirt! How much would I decrease the printing % to use it as a 2T? Letha, I would guess at around 80% for 2T, but the best way to tell for sure is to do the waist measurement--and go from there, like in steps 1 and 2. Thanks! Turns out I don't need to adjust it. My daughter's waist is also 20", so no changes needed. So cute, and my favorite part is the Dr. Pepper can in the back. I always work better with Dr. Pepper as well. Oh wow - I love it! Thank you for the tutorial! I made this today! Using exact size given since my girls are 3t! I had some difficulty with them as the petals on the print out seem more elongated than what's shown in the pictures, so I added more in each layer since there was open spots. But other than that it was great! 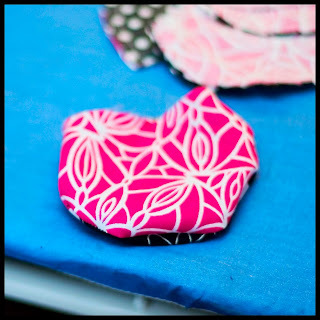 I love that it was easy to alter to fit my needs without losing the look, like other patterns I've tried!